The Salam Project actively works in the community by delivering workshops and seminars, urban poetry events, motivational talks, film showcases and conferences around the UK. They came to BCBN to support the Urban Job Club to host drop in in Stockwell (L.B. Lambeth) Willesden (L.B.Brent) and Moss Side (Manchester). 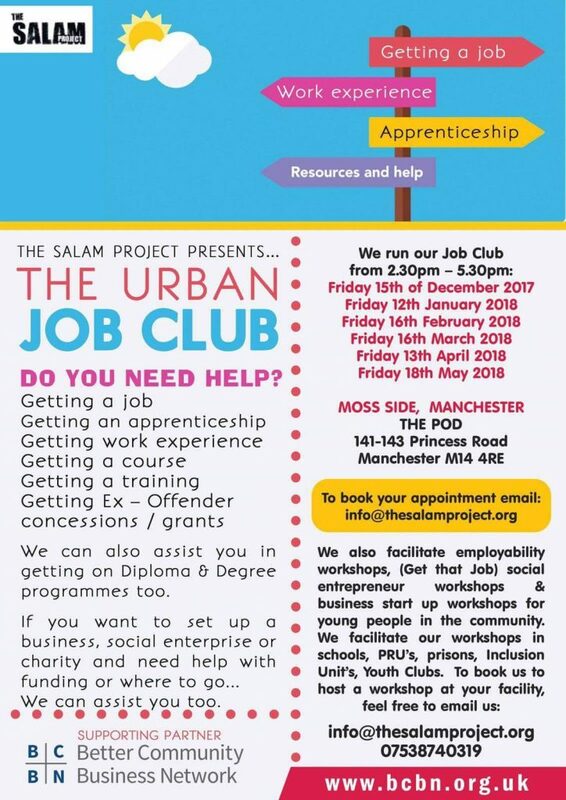 From doing this work, The Salam Project were able to help over 28 ex- offenders with employment, accredited training, work experience, small grants and housing opportunities. They have been able to team up with The Feltham Community Chaplaincy Trust to recruit more mentors, conducting workshops in Wormwood Scrubbs prison in partnership with Mother And Child Welfare Organisation and conducting offenders/ ex-offender programmes with The Zahed Mubarak Trust. The Salam Project have conducted workshops/ seminars with parents and loved ones of ex-offenders too. They have also hosted numerous programmes on gun and knife crime that correlates with the offenders / ex-offenders work.